Down in the lair, the Turtles are toggling between practice and giving Pepperoni a bath when Hob bursts in with a broken arm. The Turtles aren't happy to see him, Raphael especially, but he comes in peace and explains how government agents used a brainwashed Slash to capture all the other Mutanimals. At EPF HQ, Colonel Knight gets off the phone with his wife and then oversees Agent Bishop and Dr. Shevlin's status report on the captured Mutanimals. Mondo's tail is growing back, but Herman will require a prosthetic claw replacement (which he is being fitted with, now). Shevlin says that due to their PTSD symptoms, neural nodes for Sally and Ray similar to the one they used for Slash should suffice. However, Mondo has no PTSD symptoms and Pete is just stupid, so their nodes will take longer to calibrate. As for Mutagen Man, his damage was severe and Lindsey has been conscripted to help with his recovery process. Before Bishop can leave, Ray addresses him and asks about the ethics of what he's doing. Bishop insists that in an existential battle, in this case the survival of the human race, ethics are a lower tiered priority. Ray offhandedly mentions Bishop's flop at TCRI and lets slip that he's been keeping tabs on the Null Corporation, a couple of facts that pique Bishop's interest. Ray uses the distraction to pick the lock on his bonds with his tail, then uses stinger barbs from his wings to incapacitate the nearest guards. Bishop is tougher than he looks, though, and goes toe-to-toe with Ray, long enough for Knight and his Darkwater forces to subdue the mutant. However, in the confusion, Sally and Mondo were able to escape (Pete stayed behind), which was Ray's real goal. Elsewhere in the facility, Mondo and Sally find the garage. Mondo offers to stay behind and gather intel on the EPF and Darkwater with his invisibility powers while Sally makes her escape. She agrees and hijacks an artillery vehicle to plow through the soldiers and get out. At Mutanimals HQ, the Turtles confirm Hob's story about the attack, though Hob thinks they're just wasting time. Suddenly, Donatello notices an EPF drone outside the window and takes it out with a shuriken. Too late, as the building is now surrounded by soldiers. Winter calls in for orders and Colonel Knight tells him that Bishop is on the way with backup: Slash. *This story is continued from TMNT (IDW) #67. 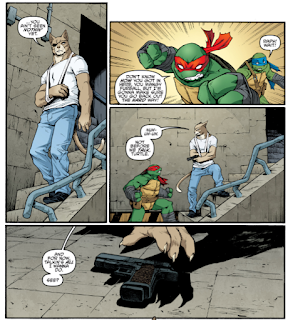 The story continues in TMNT (IDW) #69. 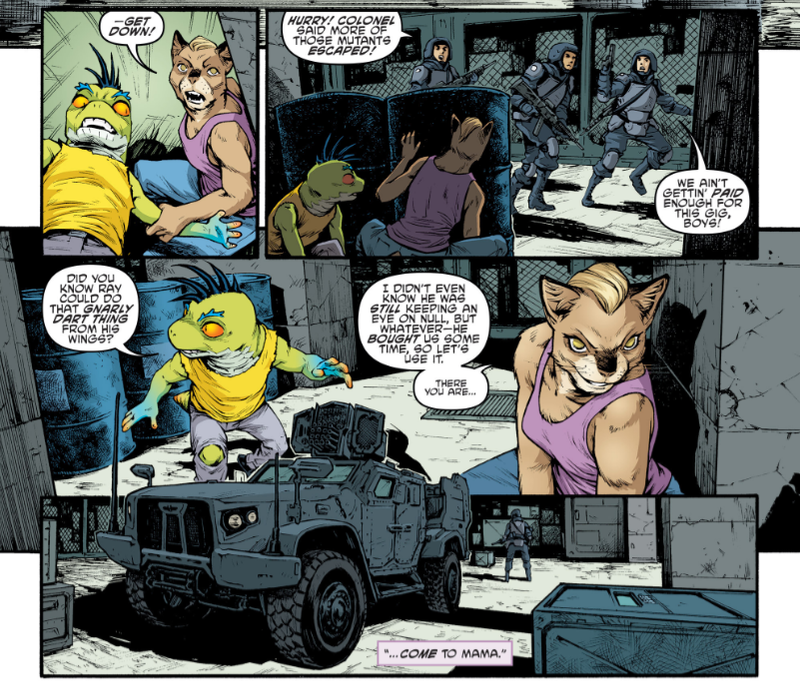 *Ray mentions the time he and Sally were prisoners of Null, as seen in TMNT: Mutanimals #2. *This issue was originally published with 6 variant covers: Regular Cover by Santolouco, Subscription Cover by Eastman and Tomi Varga, Retailer Incentive Cover by Jakub Rebelka, Heroes and Fantasies Exclusive Cover by Eastman, Comics & Ponies/Team Eastman Exclusive Cover by Eastman, and La Mole Exclusive Cover by Eastman. This issue got in another good mix of exposition and action; so far, the pacing on this arc has been some of the best. 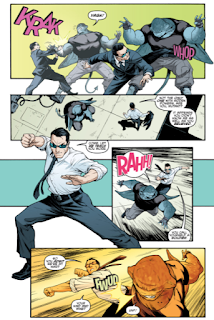 It's not frontloaded with dialogue and backloaded with fights or chases, but everything is woven together in a way that you get a satisfying bit of all elements in each individual issue. I know that seems like Comics 101, but in this era of "written for the trade" being the default style, you don't see it as much as you used to (and this book, love it as I do, can be rather bad about it). The Turtles are on the sidelines for most of this issue and their participation simply involves being brought up to speed and moving from one location to another. Leonardo is still trying to deal with being the REAL leader with no Splinter to fall back on, but that's the only bit of character work you'll find for the Turtles in this one. I do hope that Leo really does come to terms with being the Sensei, takes charge and that bit of development STICKS. I'm kind of dreading a return to status quo, where Splinter comes back to the lair and retakes his place as the Sensei and Leo just goes back to being teacher's pet and second-in-command. The real meat of this issue focuses squarely on the Mutanimals and you know how much I love those guys. 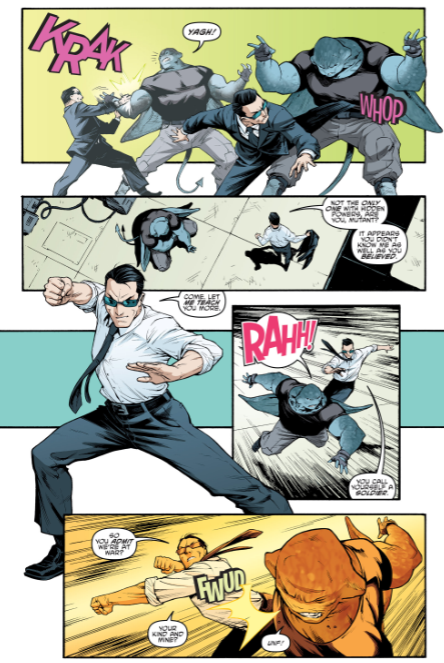 In fact, Ray gets the lion's share of attention in this issue and he could really use it. We've had an inkling of his personality and ability in broad strokes, but this was really his chance to show off (both in powers and intellect). I like him, even if he isn't the most dynamic personality (but that goes back to the Archie days), and his niche as a strategist helps him stand out among the roster. 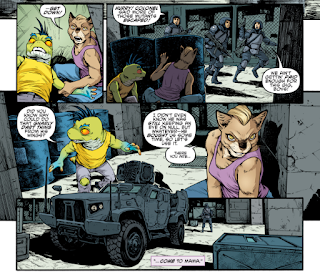 And that's one of the things I like about the pecking order of the Mutanimals, now that I think about it. You've got Old Hob, the leader, who isn't necessarily an expert at everything, but is instead highly skilled at talent scouting, coordinating people and project management. There's Ray, who is brilliant at devising strategies, but his pacifist tendencies don't make him the best warrior. Meanwhile, Herman is a true soldier, capable of following battle plans but also thinking spontaneously if things go south, albeit his loyalty leaves him somewhat unambitious. In another book, these guys would just be Leader One, Leader Two, Leader Three, but in this title they're all developed enough that you can see exactly how they fit into the puzzle and what they bring to the table. And that's before you get into Mondo being the stealth guy, Sally being the driver/pilot, and so on. It's no mystery why I love these guys. Lastly, we get to Bishop and he finally lets loose in this issue. Bishop's insane fighting prowess was one of his most memorable aspects in the 4Kids series, and it carried over into his Nickelodeon incarnation for the 2012 cartoon, so it's something I think we were all anticipating from his IDW doppelganger. While it's just a brief taste, he holds his own against Ray without breaking a sweat (though Ray gets a lick in) and the tease is enough. 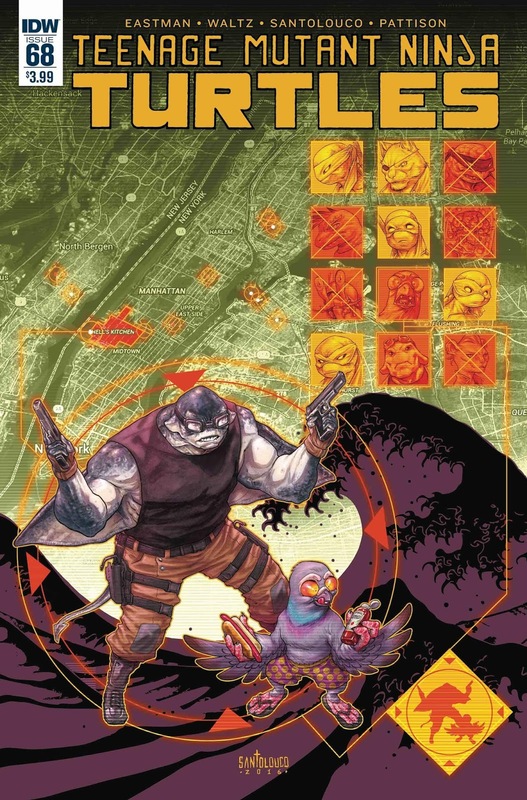 Can't wait to see him throw down with the Turtles, especially if the encounter is drawn by Santolouco. Still loving the heck out of this "Desperate Measures" arc and it's only on the second chapter. We're only halfway! Man Ray seemed to be the unofficial leader of the Mutanimals in Archie, especially the way the covers always drew him in the center or middle of them all, and how he was the first Mutanimal introduced in issue 5. So it's nice to see him take an important role in IDW. Man, if you said back in the mid 2000's that Agent Bishop (from 4kids) would be holding Man Ray (from Archie) captured, people would have laughed. I just love the fact that IDW and Nick can now mix the characters from all the different series/universe together, rather than the way Mirage did things where all the old Fred Wolf or Archie characters were segregated from Mirage and 4kids. It's amazing how much things changed from just a decade ago. I just hope they don't make Bishop an immortal or alien in this version. I hope they keep him a normal (albeit very skilled) human. True. It be nice to have another human foe 4 the turtles to fight.